There are numerous fungal leaf diseases and a few bacterial ones that do damage to leaves through the course of the season. These are seen as discolored spots or larger areas which eventually turn brown. Most of these don't start showing up until summer, but Botrytis can begin early in the spring. These only damage the leaves and don't harm the plant unless leaf damage is so severe that the plant can't grow. Treatment for these is much the same for all of them. Fungicides come in two types - the barrier type that prevents spores from entering the leaves and systemics that work inside the plant. Most of these problems can be stopped by spraying a barrier type of fungicide like copper or Daconil. Phyton works well too. Regular spraying will be necessary to get through the whole season with no damage. An article on Bacterial Leaf Streak can be found HERE. 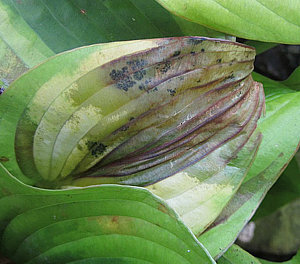 In the Garden: Hosta leaves can be kept free of these diseases by spraying a barrier fungicide. If botrytis is not a problem, spraying can begin when the first symptoms are seen. In the Nursery: To keep nursery stock clean there are a number of professional fungicides like the newer Mural that should work very well. Phyton has proven to be very effective as well.